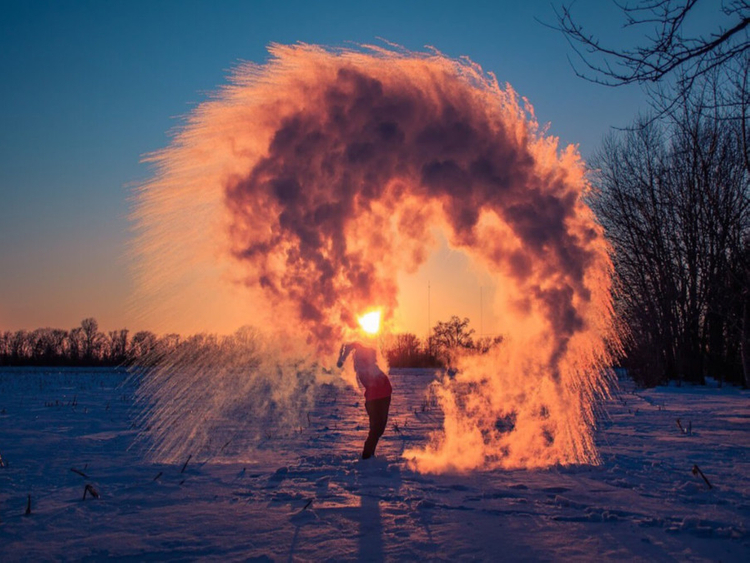 Dubai: The US is experiencing temperatures so low, that boiling water instantly turns into snow outdoors, as many social media users proved with the #BoilingWaterChallenge. Another hashtag #Chiberia (combining the words Chicago and Siberia-famed for the lowest temperature ever recorded in the Northern hemisphere) is also trending. Netizens have posted pictures and videos of frozen hair, clothes frozen mid-air, frozen bubbles and icicles forming on people's eyelashes due to sub-zero temperatures. Is the water really freezing mid-air? These temperatures are being caused due to a divergent ‘polar vortex’ (a wind system that keeps cold air locked in the polar region). Meteorologists have blamed a phenomenon called the polar vortex for the bitter cold that has descended on much of the central and eastern United States this week. The extreme temperatures have led to devastating consequences, with at least 21 deaths reported due to the cold, according to latest US media reports. Railroad staff in the city of Chicago, have been forced to set fire to rail tracks to keep trains moving, according to the CNN. Some people tried to see the lighter side of things during the cold spell however, and took to social media with the #BoilingWaterChallenge. Challenge takers should ideally take precaution however, since the water can burn skin on contact before it freezes in the air.